The Garmin / PulsedLight LIDAR-Lite rangefinder is a low-cost optical distance measurement solution with a 40m range under most operating conditions, low power consumption, and small form factor. This sensor can be purchased from Sparkfun and these distributors and then technical info can be found here. This rangefinder is only supported on the following vehicle platform versions (or later): Copter 3.3, Plane 3.3, and Rover 2.49. ArduPilot transparently supports both LIDAR-Lite v1 and v2. A number of problems have been found with the Lidar-Lite v2. Attempts to resolve these issues with the developers of the product have not been entirely successful. These notes serve as a warning to potential users. It is not yet clear if these issues have been resolved in v3. The first issue (lockups on I2C with black-label lidars) is solved by either using the new blue-label Lidars or by using the PWM output method, preferably with a reset pin. The issue is not common, but it is relatively easy to reproduce in bench tests by covering the Lidars lenses. It appears to be more likely to happen when the Lidar is reading short distances. There are two manifestations of the issue - one is where the lockup is solved by sending a I2C reset command, the the other does not respond to an I2C reset. The older black-label Lidars cause significant GPS interference. This manifests as longer time to get GPS lock on power up and higher levels of GPS noise when lock is achieved resulting in lower GPS accuracy. Testing shows that the interference includes both a conducted and radiated component. 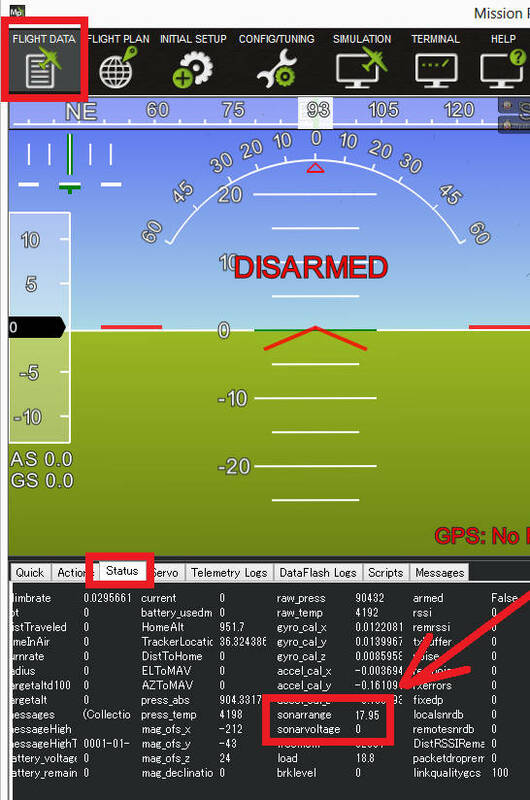 Placing the Lidar as far away from the GPS as possible helps, but does not entirely eliminate the issue. Note that the GPS interference problem does not happen with the newer “blue-label” Lidars. The newer blue-label Lidars have been associated with interference problems on I2C with other I2C devices on the same bus. In particular, incorrect airspeed readings have been seen when used on the same I2C bus as a digital airspeed sensor. This issue does not occur in all aircraft, but when it does occur the results are quite dramatic, with airspeed readings being off by more than 10m/s. Although bench testing has reproduced the result we have not yet managed to capture a logic trace of it happening. The problem is solved by using the Lidar via PWM instead of I2C. Both the newer blue-label and older black-label Lidars have a problem where they will sometimes return a distance of approximately 13m greater than the true distance. This happens on both I2C and PWM. The problem is rare, but it has been recorded in several flight logs on several different aircraft. The problem has also been reproduced in extensive bench testing. When the problem happens the 13m offset usually locks in place, so all remaining readings from the Lidar for the rest of the flight will give a 13m offset. There have however been cases where the 13m offset disappears after a few seconds or minutes. The problem is much more likely to occur if the Lidar power supply fluctuates too much. The problem can be easily reproduced in a bench setup where the Lidar is initially powered at below 4V then the voltage raised. Unfortunately low supply voltage is not the only trigger for the problem, so ensuring a good power supply will reduce the probability of the issue but not eliminate it. Multiple flight logs where the supply voltage to the Lidar is being monitored show the problem can occur with a good power supply. There is no known workaround for this issue. Detailed traces of the issue have been provided to the makers of the device with no resolution. The issue has also been reproduced using the device makers own software and own recommended hardware setup. Note: For RNGFND_SCALING your mileage may vary. Some units work better using RNGFND_SCALING=0.8. Connect with the Mission Planner and open the Config/Tuning | Full Parameter List page. Set the RNGFND_MAX_CM to 4000 (40m). This parameter represents the maximum distance in centimeters that the LiDAR is reliable over — when ignoring “0” distance readings in the driver, a value of 4000 should work well in almost all conditions. Set RNGFND_MIN_CM to 20cm. Below that distance you will still get readings, but they may be inaccurate (the optics can start to introduce parallax error if the sensor picks up signal from specular reflections rather than directly from a return signal). Distances read by the sensor can be seen in the Mission Planner’s Flight Data screen’s Status tab. Look closely for “sonarrange”. Its best to place the Lidar several known distances (1m, 3m, 5m) from a large flat wall to test it. If the Lidar is constantly reading wrong by a fixed offset e.g. its always 50cm out at each distance then adjust the RNGFND_OFFSET parameter by the correct amount. If however it gets the distance wrong each time by a different amount then the RNGFND_SCALING parameter needs changing. Update it (maybe 1.1 or 0.9) and test again and repeat until its correct.